ASTM A333 is the standard specification for seamless and welded pipe for low-temperature service and other applications with required notch toughness. Metals-Piping hold large amount of ASTM A333 Grade 6 seamless pipes in stock. 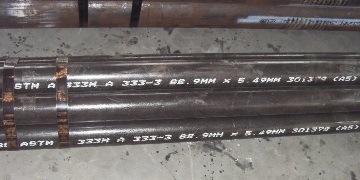 ASTM A333 Gr.6 3″ SCH40 seamless pipes in stock. ASTM A333 Gr.6 seamless pipes in stock: 2″ SCH80.